My plan to completely redesign and overhaul my daily schedule hit a snag. This past month I planned out my daily schedule and tried to establish it as my regular routine. But I quickly realized that I had bitten off more than I can chew. Planning a comprehensive daily schedule is a fine exercise. But implementing it is quite another story. My model daily schedule is fairly extensive and includes exercise, diet, work schedule, and morning and evening rituals. Trying to put all of these things into practice simultaneously has been overwhelming—not in the sense of being unattainable, but for me it’s just too much to change all at once. In Peter Bregman’s book 18 Minutes he concludes with a timely bit of advice: Don’t try to change everything all at once, rather focus on One Thing—especially that One Thing that will make the most significant positive difference. After considering this, I believe that my One Thing needs to be regular, uninterrupted studio time. 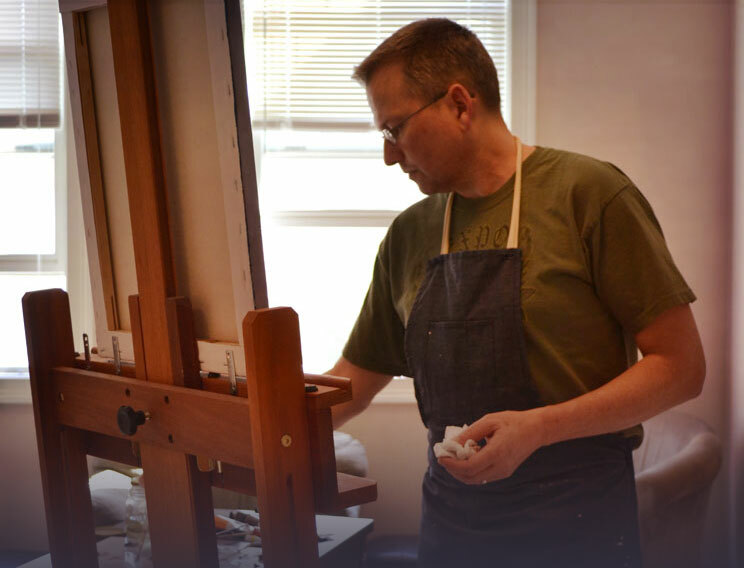 During the month of February I will be painting at my easel from 9:00 AM – 12:00 noon, Monday through Friday. That’s it. That’s my One Thing. For the sake of accountability, I will keep a daily record of my studio time in the calendar below. Successful days will be marked with a star (&star;). Feel free to comment and ask me how’s it going. Also, I’d love to know what is Your One Thing? Great strategy. Looks like you stuck with it today. I look forward to watching your progress. I have been building habits in a similar way. Quite a few are pretty well set. Sometimes I have to re-commit to those established habits because things can interrupt the momentum. In August, after trying lots of different strategies for exercise over the previous years, I realized I needed to consider why it wasn’t sticking. I analyzed my excuses. I felt like a needed to pick a time of day that would work all year long and even on most days when I have commitments in town. The time that felt doable even on the shortest and coldest days of winter and at the end of a busy day was 4 pm. I made a commitment to walk every day down the mountain and back up. It’s become a part of my day and I look forward to it. While I do miss it sometimes, I am happy with the frequency. Hi Sue, Thanks for taking the time to comment! I agree with your idea to pick a doable time, place, and a level of engagement to establish your habit. And walking down the mountain and back sounds like a wonderful refreshing habit. By the way, I hereby give myself permission to paint with the Asheville Urban Landscape Painters instead of my studio on Tuesday mornings and still give myself a star! Very cool. Thanks for sharing! BTW, are you painting in oil now? Also, I thinking of buying a easel for my studio. Can you recommend a good one? Thanks! Hi Jack, Great to hear from you! Actually almost all of the painting I do these days is acrylic, not oil. With the exception of portraits, which I block in in acrylic and finish in oil. Oil is just more buttery and better for blending. Regarding a studio easel, I have a Richeson Dulce. 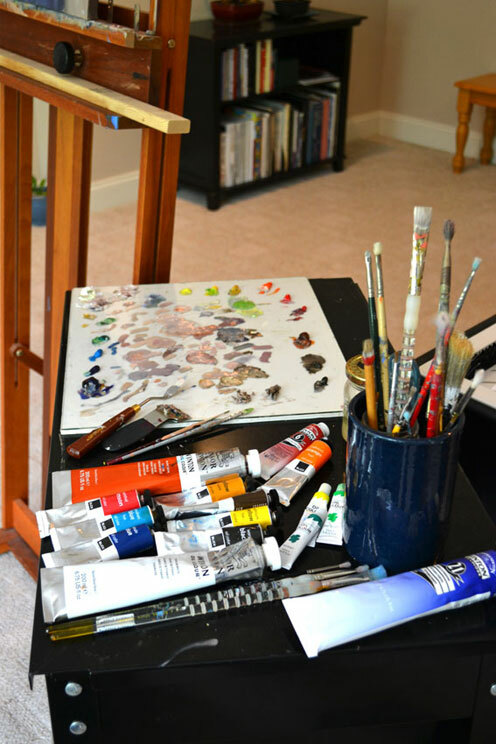 It does everything an easel should do and was reasonably priced at Blick. I know some studio easels are ridiculously expensive. P.S. I love the small paintings you’ve been doing and the sketches of buildings that you’ve been posting to Facebook. Brilliant advice to pick “one thing”. Pick one thing and do it well. Give yourself the time to do it without thinking about all the other things you need to be doing (the hard part for me)… Looks like it’s working for you! Lovely paintings! Good idea with making a schedule and holding accountability for yourself. That’s what I need to do, and instead of giving myself one hour a day in my art room, I need to plan out like 3 hours a day. I would love to be a full time artist. You are so lucky! You inspire me and I hope it’s ok I add you as a friend? Hi Linda — Thanks so much for your note and your interest in my art blog. To subscribe, go to my Catalog Page and grab my current Catalog of Artwork. You’ll be subscribed to my newsletter and you’ll get future notifications for new blog posts. Thanks again for reaching out. Great to be in touch! P.S. I love your art! I subscribed to your newsletter.